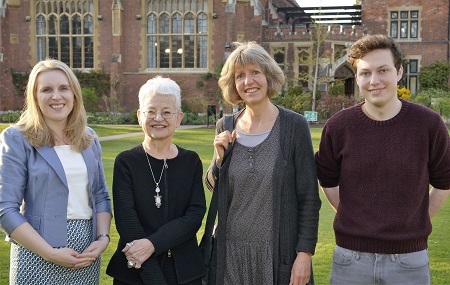 Dame Jacqueline Wilson delivered the 2019 Philippa Pearce Lecture last week at Homerton College, Cambridge. Her title was "Be Careful What You Wish For". Dr Louise Joy, chair of the Philippa Pearce Lecture steering committee, said: "Listening to Jacqueline's talk was like reading her books: it was like being in the company of a wise friend - being confided in, trusted with secrets, given privileged access to what it is like to think and feel from others' perspectives. Jacqueline's meaty, searingly insightful lecture, which wove together children's classics from Maria Edgeworth to PL Travers, E Nesbit to Philippa Pearce, was full of warmth and humour." Previous Pearce lecturers have included Michael Rosen, Philip Pullman, Michael Morpurgo, Malorie Blackman, and Chris Riddell. Philippa Pearce was the author of children's classics including Tom's Midnight Garden.